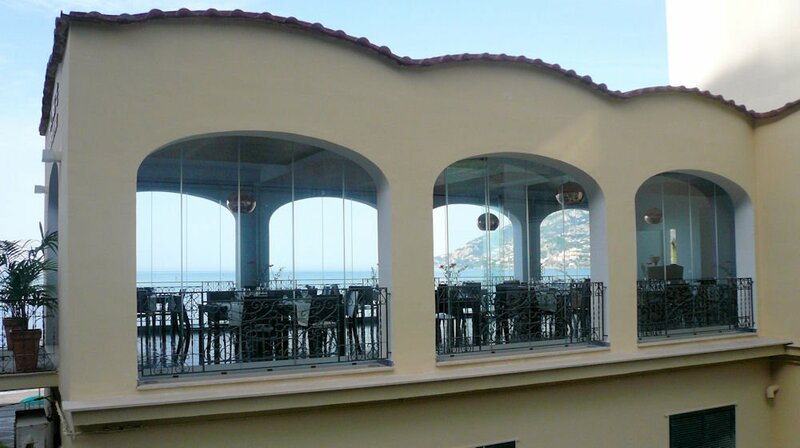 The GIEMME SYSTEM is an ideal solution for hotels and restaurants that want to make use of porches, terraces or other spaces in all seasons. At the elegant Tartesh Hotel in Sardinia , the Giemme System folding glass doors that enclose the hotel dining room create a mirror effect with the light reflecting on the swimming pool. Among the latest achievements is the modern veranda of the Adlon Hotel in Bibione with its 20 linear metres of continuous glass. 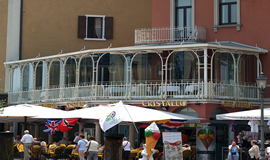 The dining room of Hotel Europa in Riva del Garda, built on the terrace of the first floor and surrounded by the GIEMME SYSTEM glass doors, has a privileged location to view the square in front of the lake. The Giemme System glass doors also fit in perfectly with a more rustic style such as at "La Griglia" (la Grille) in Argegno that has created an all glass veranda. 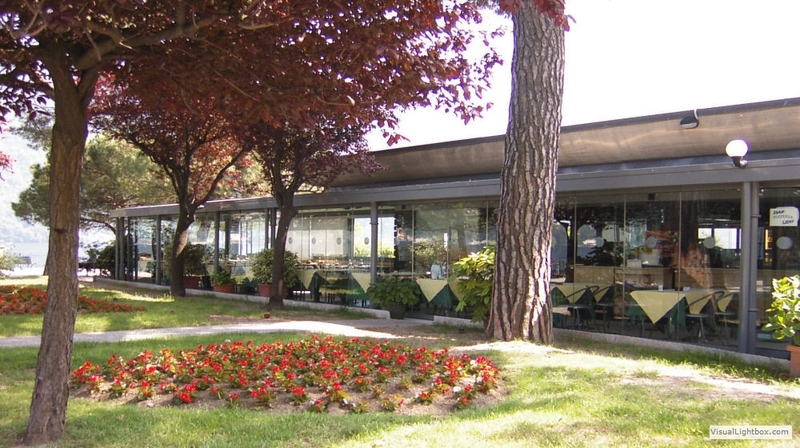 Thanks to the Giemme System glass doors, Holmes Restaurant and Pizzeriawas able to make the most of the narrow spaces in front of Lake Como. 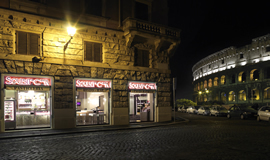 One to remember also is the restaurant Squisito Cook in Rome in front of the Colosseum. 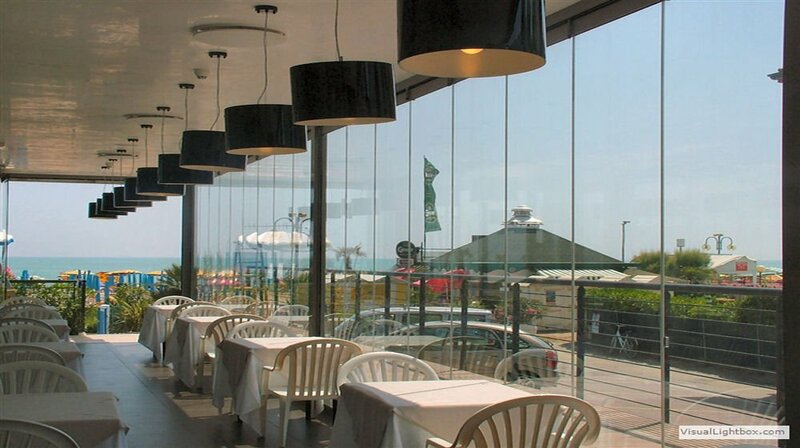 We are also involved with the design and construction of structures for verandas or for businesses such as restaurants, hotels, pubs and bars. We propose structures consistent with our “all-glass” philosophy. We use minimum fixtures to leave as much space as possible for the glass. We make glass roofs which can be opened. If your needs are different, we can also create structures with opaque roofs and insulation. The perimeter pillars and the support structure can be in iron or wood depending on your needs. All our creations are custom made. We provide certification of compliance with the regulations. Doors fold up to the mounted side. Also available without a floor guide rail up to a maximum of 4 doors. Can be opened internally or externally. 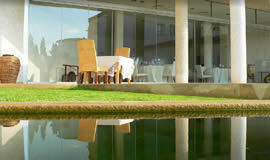 3D is a classic glass door for hotels and restaurants without doors and handles. With a hinged entrance door. Glass doors fold up to the opposite side. The glass doors fold up to the mounted side. Also available without a floor guide rail up to a maximum of 4 doors. Entrance door comes with handle, lock and door closer. Can be opened internally or externally. With a hinged entrance door. Doors can be folded up to the mounted or entrance door side. Doors can be folded up to the door side or mounted side. Only available with a recessed guide rail. Can be opened internally or externally. Entrance door with handle, lock and door closer.